The environmental limits on China’s current road of economic growth will become increasingly apparent over the next five years, prompting policymakers to either change direction or brace for a nasty collision. Their ability to do so will depend on what they are driving—which remains open to question. For all the talk of the ‘Chinese model,’ nobody can seem to agree whether it’s a juggernaut or a jalopy. From a purely economic perspective, it looks very much like a juggernaut. Having overtaken Japan and still motoring along at double-digit pace with a fifth of the world’s population on board, the speed and size of China’s GDP is awe-inspiring. But from an environmental viewpoint, it more closely resembles a jalopy—belching fumes, wasting fuel and constantly in need of a radiator refill. Over the past five years, China has become the world’s biggest energy consumer and greenhouse gas emitter. Its longstanding problem of water scarcity in the north has been compounded by pollution, overuse and drought, to leave an accumulated deficit of more than 200 billion cubic meters. These problems show no signs of abating without an overhaul. On the latest trends of population growth, rising affluence and energy use, the emissions of the average person in China will surpass those of Europeans within five years and Americans within 10. Demands for water, energy, food and almost every other resource will also intensify, despite warnings that they are already beyond sustainable levels. Until now, Beijing has managed to avert a crisis with a series of supply-side solutions to provide more water and fuel, while tinkering with the engine mid-drive. It has embarked on the world’s biggest hydro-engineering project—the South-North Water Diversion Project—to channel rivers to the dry north. It has intensified diplomatic and trade efforts to secure coal, oil, timber and other resources in Australia, Africa and South America—adding to the competitive pressures with the United States. And it has boosted the efficiency of its industrial sector by investing heavily in new power plants and renewable energy. The upgrade to a sleeker, low-carbon economy is an expensive and difficult task that is a long way from completion, but China appears ready to pay. Last year, it invested $34 billion in ‘clean technologies’ compared to the United States’ $18 billion, according to the World Resources Institute. The two biggest alternative energies—hydro and nuclear—will see a rapid expansion over the next decade, though they too have an environmental cost. Wind energy generating capacity is growing fast (China became number one in this field too last year), but more than a third isn’t yet connected to the grid. Development of solar power, eco-cities and electric vehicles has even further to go, but the government has committed considerable funds to realise these goals. It has been far less willing to implement demand-side constraints, which is understandable given the relatively low living standards in China compared with developed nations and the fear of social instability if growth slows. Where it has been forced to impose limits—on pollution control—results have been mixed due to corruption, poor governance and the often conflicting goal of economic expansion. Given this background, the Politburo has preferred to set ‘intensity’ targets—for example on energy and carbon emissions—that are pegged to GDP. But there are signs that this may be changing as the environmental road grows more bumpy, crowded and dry. Beijing recently imposed its first restrictions on car ownership, cutting new registrations by more than two-thirds to alleviate traffic and pollution problems. Last month, state planners said China would impose a cap on annual water consumption of 670 billion cubic metres, as well as doubling spending on conservation and efficiency measures over the next 10 years. In the next five-year economic plan—due to be unveiled in March—the government will also introduce pollution reduction targets for nitrogen oxide and ammonia in addition to the existing goals for sulphur dioxide and chemical oxygen demand. Along with a proposed environmental tax, this is likely to add to the costs of industry, but it should mean that China’s notorious smogs finally start to dissipate. To the frustration of many trade partners—particularly Japan and the United States—the government is also limiting exports of rare earths used in high-tech manufacturing. This is partly justified on environmental grounds—the mining is dirty and China no longer wants to be a supplier of primary resources—but largely because it wants to move up the value chain by keeping those metals for production of home-made technology. A still cleaner shift of direction, however, would entail an overall target to limit energy use—and by association set a peak for carbon emissions. 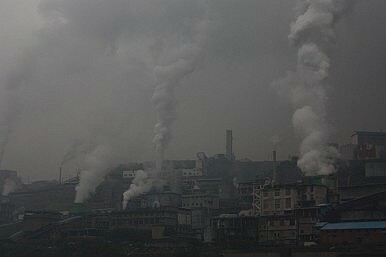 This radical step is still being debated by five-year planners, who are trying to reduce China’s dependency on coal, which is the main source of greenhouse gas and acid rain, as well as being a blight on agricultural land and river systems. For all its investment in clean technologies, China remains addicted to this dirtiest of fossil fuels, which still supplies 77 percent of the nation’s energy. Limiting the use of this primary fuel is essential for China and the world. Without this change, there can be no transition from carbon-burning jalopy to high-tech juggernaut and the drivers of the economy will find it harder to maintain control. Easing off the accelerator now will be far easier than slamming the brakes later on. Dr. Kenneth Lieberthal on China's plans for economic reform, environmental clean-up, anti-corruption efforts and managing territorial disputes. China's Challenges: EconomyHow to Improve China-US TrustChina’s Highly Unequal EconomyThe Return of Smile DiplomacyGeorge Orwell’s China?